Obama drones: Pitch Interactive data project is problematic. 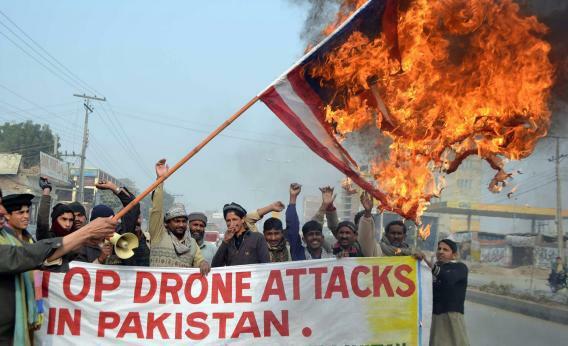 A Pakistani demonstrator holds a burning US flag during a protest in Multan on January 8, 2013, against the drone attacks in Pakistan’s tribal areas. But this study should be taken with a grain of salt, as this Reddit thread points out. The Pitch Interactive project estimates that 22.9 percent of those who’ve been killed in Pakistan by drone strikes were civilians. To put that in perspective, the Iraq Body Count project estimates that more than 60 percent of those killed in Iraq since 2003 were civilians. It’s also good to keep in mind that the visualization is a bit misleading—the number of attacks and victims aren’t exact, which speaks to the clandestine nature of drone warfare. From Pitch Interactive’s website: “This project helps to bring light on the topic of drones. Not to speak for or against, but to inform and to allow you to see for yourself whether you can support drone usage or not,” but goes on to say they wanted to “give an emphasis on the victims.” The data are murky, but they’re presented in a way that fits nicely into the “against” column. I’m of the opinion that more information is usually a good thing, so it would be nice to see a full spreadsheet of the data and the methodology Pitch Interactive used. In both drone warfare and data reporting, a lack of transparency runs the risk of misleading the people supposedly being served by it.